Horizontal rain lashes my face under Jarlshof’s gunmetal sky. An unforgiving wind whips off the Atlantic Ocean mere metres away. An umbrella can’t withstand it; a slicker is barely better. Aye, it’s a bonny day to be in Shetland. This weather gives insight into the special character of Britain’s most northerly outpost. Shetland is an archipelago of more than a hundred islands scudding some 90 miles across the North Sea. Though part of Scotland, it lies closer to the Arctic Circle than to London. It’s raw, rugged, remote — and recently popular, thanks in part to the television series Shetland, based on Ann Cleeves’ novels about detective Jimmy Perez. But I have a more personal reason to be here. My father was Danish; my mother, half-Scot. Shetland embraces both those cultures, and Jarlshof, the islands’ most important archaeological site, embodies that marriage perfectly. About 1,200 years ago, the Vikings arrived in Shetland, the first landfall south of their Scandinavian home. Some settled, at Jarlshof and elsewhere on the islands. Shetland remained in Danish hands until 1469, when the king mortgaged it as a dowry for his daughter’s marriage to Scotland’s king. Scandinavian influences linger still. Shetland’s flag may carry St. Andrew’s cross, but its colours are Norwegian blue and white. 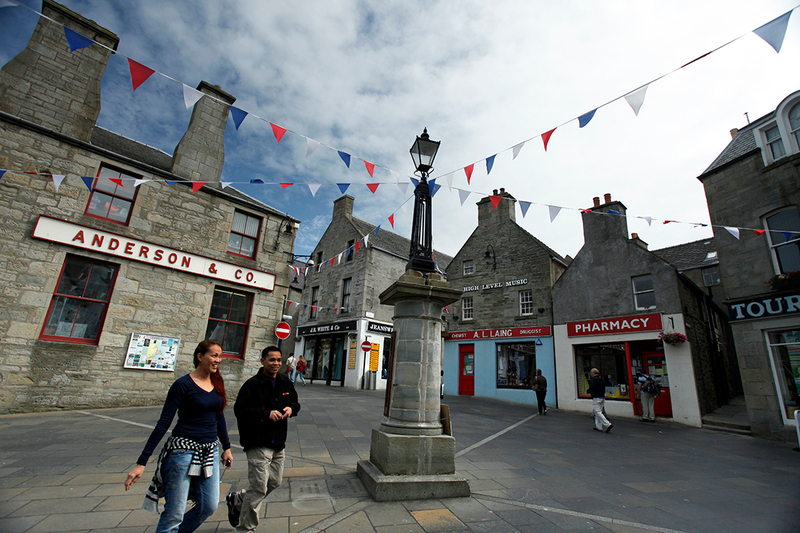 Place names almost all derive from Old Norn; the streets of Lerwick, Shetland’s main town, bear names like King Haakon, King Harald, St. Olaf. A popular brewery is named Valhalla, after the mythical hall where slain Norse combatants were taken. 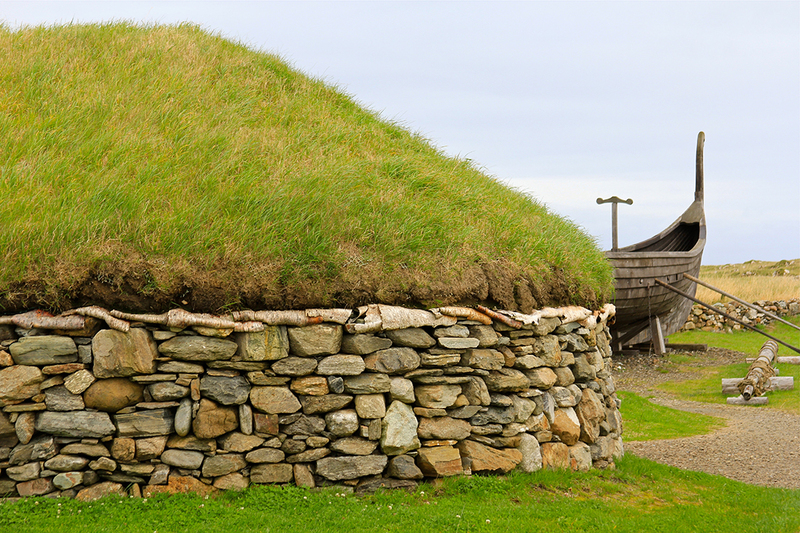 At Jarlshof, we tour the remnants of the Viking era, including longhouses that were their signature building. Only foundations remain, but an introductory video and interpretive panels helped us picture how the houses looked and how they were used in daily life. As a bonus, Jarlshof has ruins from two other cultures, too: the Picts, who lived here during the Bronze and Iron Ages, and early Scots, thanks to a 17th-century castle built by the odious Robert Stewart, once laird of Shetland. More Viking stories lie in Unst, Shetland’s most northerly inhabited island. It boasts more than 60 Viking longhouses, the world’s largest known concentration. Most aren’t excavated, but you can visit a few. Our favourite experience was on the outskirts of Haroldswick, where a reconstructed longhouse gave us a good sense of what home life must have been like: it was dark and dank inside, with livestock quartered at one end and people at the other. Adjacent is a full-sized replica Viking longship, the Skidbladner. The nearby Unst Heritage Centre further enriches the story. There are more recent Scandinavian ties, too. One of the most poignant is in Scalloway, a fishing village 25 minutes from Lerwick. Its volunteer-run museum relates the story of the Shetland Bus, a clandestine Second World War operation. Its aim: to aid Norwegian resistance against the Nazis. In ordinary fishing boats, which sometimes didn’t survive the treacherous North Sea, Britons transported arms and supplies to Norway and spirited refugees back. The story is so salient to Norwegians that their king opened the museum. Our Jarlshof weather made clear just how skilled Viking sailors must have been, and how tough life must have been on land. It rains 250 days a year in Shetland. This is where Britain’s strongest-ever wind was recorded. Our rental car carried a warning sticker to take care when opening doors during strong wind: “During strong wind, please take care when opening the doors.” During a concert we attended, musician Phil Cunningham quipped: “I flew in last night from Edinburgh. It was so windy the landing cured my constipation.” And yet, the Gulf Stream guarantees moderate temperatures, even in winter, and we were blessed with dry spells for most of our nine-day visit, giving rise to the magical colours of sky and earth for which the archipelago is famous. The Vikings, like modern-day islanders, also had to contend with breathtakingly wild terrain. 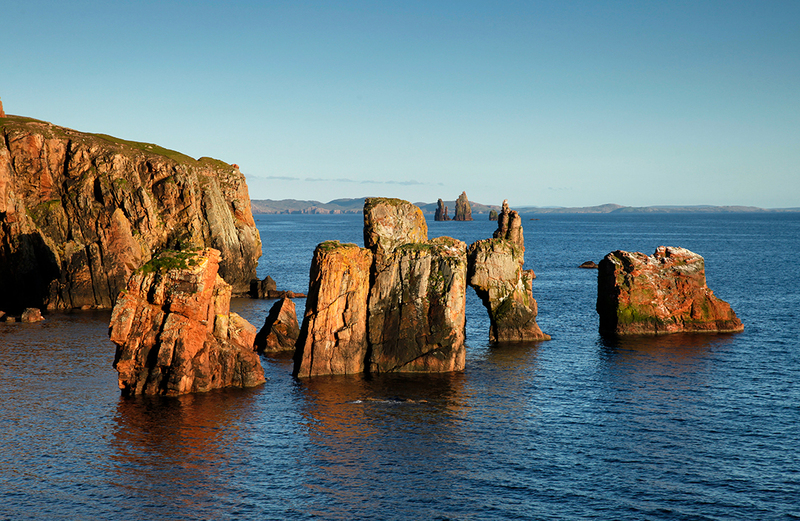 Indeed, Shetland’s biggest draw is its rugged beauty, best appreciated on foot. Our two favourite sightseeing stops were along the road to Esha Ness in northwest Mainland and Hermaness, a nature preserve on the northernmost tip of Unst. We reached both by cliff-hugging single-track roads — the kind that test one’s driving skill and comfort with thoughts of the afterlife. But stunning views of the whitecapped Atlantic lashing against red basalt cliffs and sea stacks is payoff enough. At Hermaness, a broad, well-groomed gravel path and boardwalk climb up moorland to jagged cliffs tumbling 175 metres (574 feet) to the sea. They command gorgeous views of Muckle Flugga, an uninhabited rock that houses a lighthouse designed by the uncle and father of Robert Louis Stevenson. (The map of Treasure Island was based on Unst.) Our September visit was too late to spot most of the 100,000 seabirds that breed here — guillemots, gannets, puffins, kittiwakes, great skuas and more — but wildflowers made up for it. Shetland offers pastoral beauty, too. On a quiet Sunday, we took the five-minute ferry from Lerwick to the island of Bressay. We walked its country roads, passing by well-tended crofts, Shetland’s traditional small mixed farmlands, with colourful gardens and rolling pastureland. We stopped at a general store we chanced upon; its Sunday hours were two p.m. to four p.m. We couldn’t help asking why the peculiar timing. “Because that’s when the Sunday papers come in,” the owner replied. My wife’s only demand of our trip was to pet an adorable Shetland pony. (They, too, are thought to have Viking roots.) 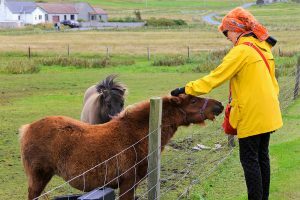 In Bressay, Oxana had her wish when two curious ponies meandered up to us. One nosed my wife’s purse as if expecting a treat. We encountered many more as we drove north, often having to stop until they moved off the road. In Shetland, farmers don’t always erect fences. Petting a Shetland pony on Bressay. Photo by Peter Johnasen. Shetlanders don’t build fences against visitors either. Our B&B hosts on the island of Yell whipped up dinner when the island’s only restaurant unexpectedly closed for repairs. A local at The Lounge, a watering hole featured in the Shetland TV show, sat down to chat when he heard we were Canadian. A trio of knitters in Scalloway invited us to share tea after one of them recognized us from a concert the night before. They were more welcoming than Vikings ever were. Accommodation: In Lerwick we stayed in a lovely, central flat above a wine shop run by warm Airbnb hosts. On the island of Yell, the Old Post Office B&B in Gutcher serves amazing breakfasts and dinners using produce from the owners’ own hens and garden. Busta House, on the outskirts of Brae, is a charming country hotel in a 16th-century manor. Chickens roam the pretty gardens; a ghost, the halls. Dining: Local seafood and lamb are Shetland musts. Recommended: Scalloway Hotel, this year’s best informal dining room in the Scottish Hotel Awards; Hay’s Dock in Lerwick, for succulent lamb and innovative vegetarian dishes served at tables adorned by local artists; Frankie’s in Brae, voted Britain’s best fish-and-chips shop; and Victoria’s in Haroldswick, Britain’s most northerly tea room, with tender lamb from its own croft. Special events: Up Helly Aa, a 24-hour Viking fire festival (late January); the Shetland Folk Festival (early May), Shetland Boat Week (early August), and Wool Week (late September).